For all those who have never gelled properly with Windows Vista and have always been complaining about it, now you have a reason to smile. Microsoft’s next offering is here, the bigger and better Windows 7 that improves significantly over Vista. 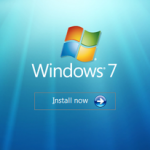 While there are numerous reasons to upgrade to Windows 7, we have 7 most significant points listed out here that can iron out the wrinkles from Microsoft Window’s reputation, to once again compete for the coveted crown of the Best Operating System. 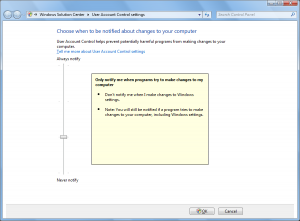 Even the most satisfied Vista user complained about its User Account Control’s nagging pop-up dialogs that confirms a way too many times that you wanted to do the thing you just told the computer to do. In Windows 7 it is not done away with, but you can fine-tune the level of nags, warnings, and confirmation prompts you get. This ensures that Security is maintained while not being over-protective and annoying. Another common complaint about Vista has been the amount of time it takes to boot.Windows Vista is really sloooooow when it comes to starting up and getting your desktop up and running, but even the Beta and RC version of Windows 7 show 20% faster boot times than Vista. Also the overall performance is better and programs and services run considerably faster on those computers have good hardware to support it. Even the Shutdown times have improved in Windows 7 over Vista. Now there is a “Shut Down” button instead of that ambiguous power icon in Vista. Speaking of which, Windows 7 seems to shut down significantly faster than Vista. You don’t have to strain your brain figuring out how to run an old application with Windows 7, which is another annoying problem with Vista. For those out dated applications that do not work under Windows 7 normally, you can download a free Windows XP Emulation Engine from the Microsoft’s website and run those applications in an emulated XP environment. 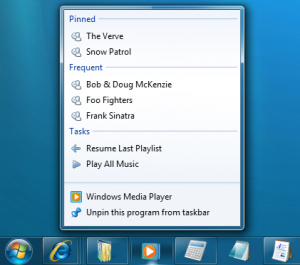 Windows 7’s taskbar has greatly improved over that of Vista’s, while still retaining a similar look and feel. The individual tabs and minimized are now nowhere to be seen as they are grouped and packed into a small Icon on the taskbar. On a crowded desktop covered with too many windows the new “Aero Peek” feature, lets you preview the individual windows from grouped taskbar apps and also close the documents from the thumbnail itself. Now you can pin numerous programs to it for easy quick launch, which gives it a Mac OS X dock feel. Drag just about anything on to it and the associated application will place itself on the translucent taskbar, with an option to open the file in the Jumplist which is another interesting feature. Jumplists give you the option to view a list of recently accessed files by any application, even when it is not running. By right-clicking on the application’s icon in the taskbar it gives you a list of files associated with it. It also enables you to quickly access a favourite play list without opening your Windows Media Player. The notifications bar has also improved and a ‘Show Desktop’ button has been added to it on the extreme right. 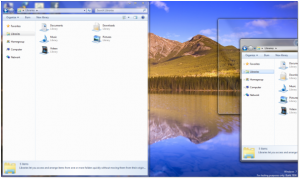 With Vista you have to manually resize application windows to view side-by-side. Windows 7 has a cool new “Snap” feature with which you can drag windows to each side of the screen and they automatically size themselves to take up half the screen. If you drag the window back away from the edge, it goes back to the size it was before. Another cool new “Shake” feature lets you clear the desktop of all background windows by grabbing the top bar of the active window and moving it back and forth quickly. The Action Center is the new and fortified Security Center for Windows 7, that integrates with other notifications such as updates. It also incorporates the improved troubleshooting, online solutions and recovery facilities. Everything that annoys you and nags you is rolled into one place with one icon in the notification bar. Troubleshooting a problem has never been so easy till date. Just with a few simple clicks almost everything works fine again. You can let Windows display several cool new wallpapers, all in a desktop slide show and choose how often you’d like the images to be changed and whether to shuffle it or not. And if a slide show based on your standard wallpaper isn’t enough, then you can always create a theme that extracts images from an RSS feed. The slow Sidebar found in Windows Vista is gone! 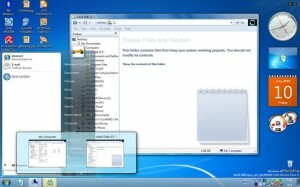 In Windows 7 should you want the Gadgets to run it can roam free across the desktop. This time, the gadgets feel less distracting and smoother than in Vista. 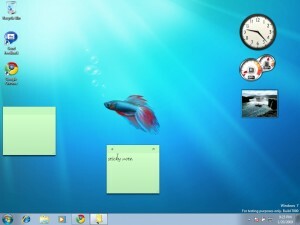 The Sticky Notes gadget is simpler and makes more sense in Windows 7. The in-built basic and easy-to-use calibration tools in Windows 7 will please you as it enables you to get the highest quality from your monitor by calibrating your screen to suite it. While many feel that Windows 7 and Windows Vista are same under the hood, in reality they are not. They look the same on the outlook but Windows 7 performs way better than Windows Vista and integrates a variety of cool new features. Surely, it is worth the upgrade. All the seven reasons that say why windows 7 is better than windows vista convince me to install windows 7 operating system in my laptop. All the shortcut features are amazing so you can easily navigate from 1 program to another.